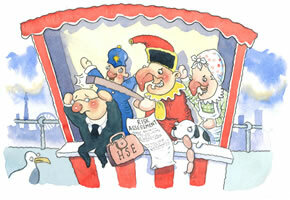 A Punch and Judy man received a standard letter from an event organiser asking him to submit a health and safety risk assessment. However when he questioned the need for it, they 'backed-off' and no paperwork was required. It sounds like wires got crossed somewhere and perhaps the standard letter was sent in error. If a written assessment is needed - keep it fit for purpose, and crucially: act on it. Paperwork without action does no one any good.